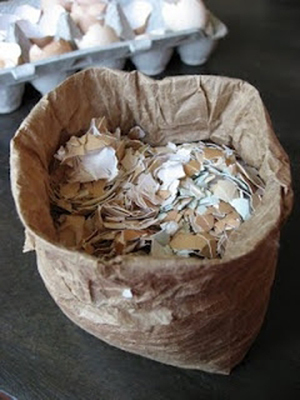 Here are few fun tips using egg shells to help improve your potted gardens. 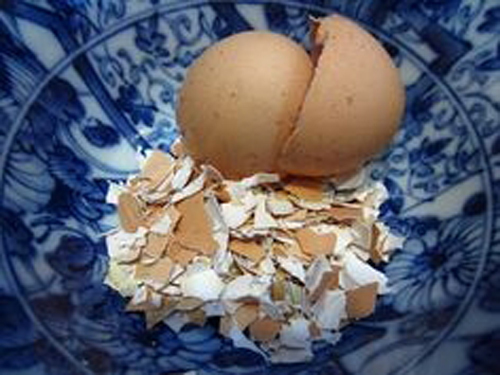 Add ground egg shells to the bottom of your potted plants or veggies. This gives the plants a nice dose of calcium which helps stop the blossom end from rotting. If you have larger pieces of egg shell use them to cover the drain hole so that the soil won't run out. They are lighter than rocks and they will allow the air flow to move easier into the soil. Over time they will break down and give your potted plants nutrients. Add finely crushed shells directly to your compost bin. Make sure you crush them up very well or grind them into a powder with your blender. This is a easy and natural way to add nutrients to the soil you use next season in your potted plants & vegetables. You can even use a old coffee grinder. Just make sure to clean it out well. If you have an issue with worms or slugs climbing into your planters, try sprinkling the surface soil with crushed shells. These guys don't like crawling their tender bodies over the sharp shell pieces. This also works well with pets on indoor potted plants. Cat's like to scratch the soil but the rough egg shells don't feel nice on their paws to they stay away.